Ever thought of having a laser projector that is small in size and light-weight so that you can conveniently bring it around and on top of that being compatible with many portable devices on different occasions? I-connect ViewX Laser Pico Projector could be the right projector for you. I was totally impressed with the size and weight of I-connect ViewX Laser Pico Projector when I first got it for a review. It sports a dimension of 14mm x 60mm x 118 mm and weights only 122g including battery. It looks just like a mobile phone and I’m sure it fits nicely in any adult’s hand, even kid’s! 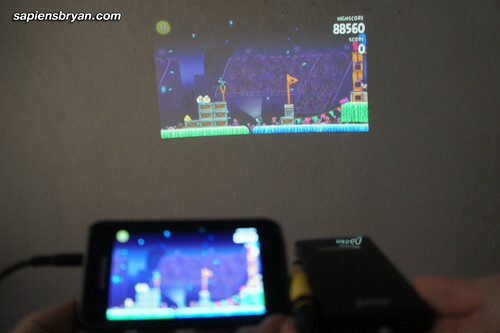 I-connect ViewX Laser Pico Projector is the first palm-sized projector that is compatible to Apple’s iPod touch, iPhone and iPad. 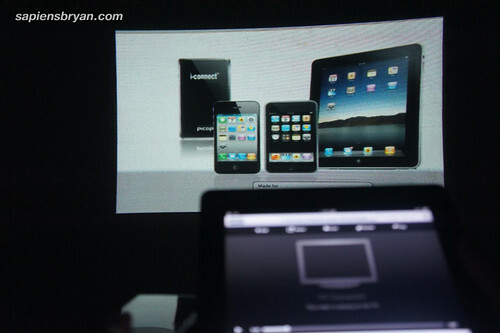 The projector is completely plug-n-play and it works instantly with all these iOS devices. 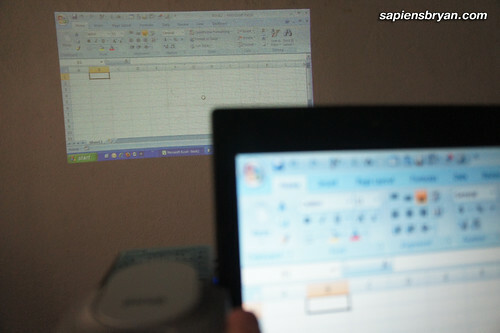 I tested the projector with my iPad 2 and found that it only works in 2 modes on iOS devices: 1. Video playing mode (playing video in iPad or online video on Youtube) & 2. Photo slideshow mode. Mobility is one of the main selling points of this palm-sized laser projector and therefore its compatibility does not end with Apple products only. 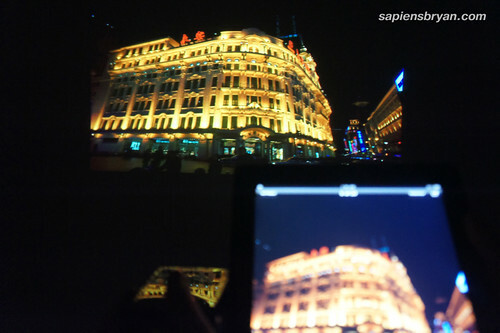 A wide variety of devices with TV-Out function are supported as well, such as mobile phones, digital camera, video camera, etc. This feature is particularly very useful when you need to view your digital media on a larger screen on different devices when you are on the go. 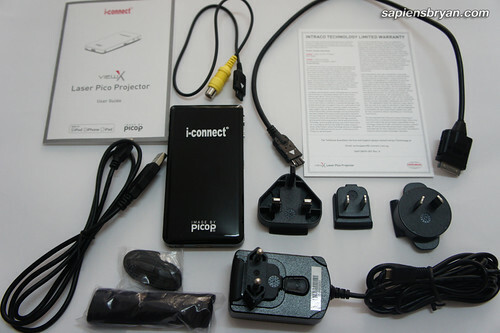 Conventional VGA port that we can find on most, if not all, PCs and laptops is of course supported on I-connect ViewX Laser Pico Projector too. However, a VGA dock is sold separately if you need to use the projector with PC or laptop. The good news is the VGA dock is included for free if you get it now in Malaysia. Instead of using LED bulbs like other conventional projectors, I-connect ViewX Laser Pico Projector uses the revolutionary PicoP display engine (uses blue, green and red lasers to create an image) to deliver immediate vivid big screen experience with no focus adjustment needed. 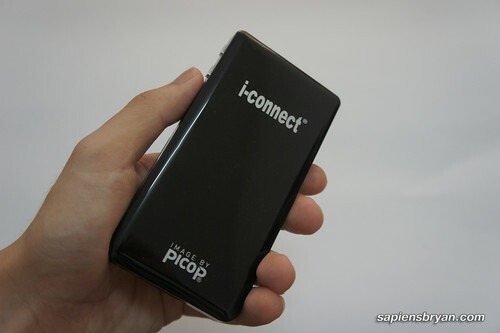 I-connect ViewX Laser Pico Projector is truly useful for both business and leisure purposes. This laser projector can be used on many occasions, be it on a business presentation, showing photos/videos taken during a vacation, watching movie projected on the ceiling while lying on the bed at night, etc. Projecting digital medias from a wide variety of devices has never been so convenient on a projector like this considering all the plus points listed above. Well, the only concern I have for the projector is the rather short battery life. I hope the supported projecting modes on iOS devices are not limited to only video playing and photo slideshow in the future. I-Connect View X Laser Pico Projector is available at the retail price of RM1399 (including VGA dock) and can be purchased at Challenger IT Megastore at The Mines Shopping Mall in Malaysia or via TimeTech online store. nice article.. i like it.. I learned a lot by reading your article. I have been reading your blog site a lot in the last few days and contains earned a spot in my bookmarks.